Recommended ships: Nightmare, Raven, Vargur. Maelstrom w/ Passive Tank + Maelstrom w/ shield transfers, Drake w/ Passive Tank + Recharge Rigs + Drake w/ Passive Tank + Recharge Rigs (split aggro), Nighthawk /w Passive Tank + Dominix Support Repping, Maelstrom for DPS. When you arrive the pocket will be empty with only the Drone Structure at 100km. Drones will start spawning when you close to 60km of the structure. Everything aggros. (Reducing Damage): If you trigger the initial groups, warp-out, then back in; The drones within the Drone Structure will not aggro with the rest of the room because they are too far away. (Speed) If you can handle the damage, you can put the 50km approach time to use by destroying the Drone Structure and triggering Spawn 4. 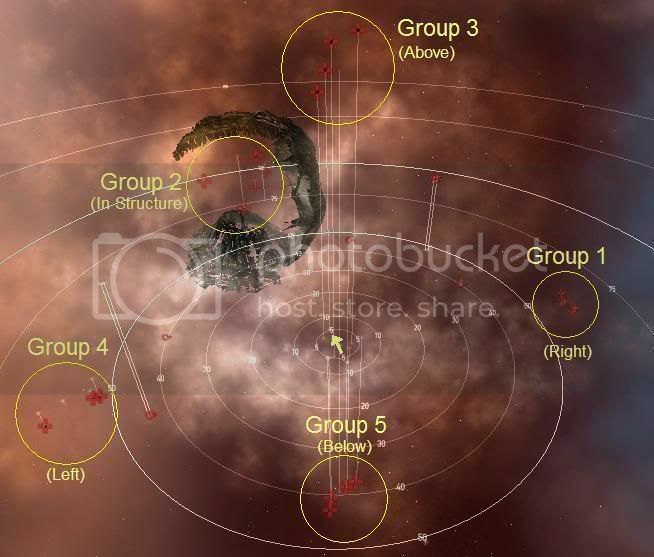 You can kill several ships by the time you reach the proximity trigger of the main groups. I also noted that groups spawn differently, had a spawn after popping a few warp scrambling frigates. The thermal cruise missile batteries make things interesting, as the typical rogue drone tank (heavy explosive with a bit of kinetic and dashes of thermal and EM) is modified with the mass amounts of extra thermal damage. Recommend primary'ing the cruise missile batteries if not tanked against thermal. After completing the mission, for giggles I let my drones attack the drone structure in the room whilst I salvaged. When the drone structure popped, 4x Battleships (Alvus Queen, iirc) and 4x Battlecruisers spawned. They dropped an addition 1km3 worth of drone poop, so it's definitely worth taking out the structure. Drone structures in parts 2 and 3 of this mission series did not drop any items or cause any additional spawns. Distances listed in this report are the range at which the spawn in from the beacon. The Energy neuts were tagging us at 90km or so. The Neut III battery is tougher than the others. They targeted only one ship and drained the cap almost instantly. The neuts will drain you from 250km. The cruise batteries can not hit you past 165km. Skip to the comments section of part 2 of 3 for a way to two man this mission. Done in Tach Nightmare with a logi. I just slowboated to the spawn point, killing Spawn #4. Then everything spawns in over period of 30 seconds. Take out neuts, then missile batteries, then everything else. Patriarchs orbit around 8k, but my HH2s and my logistic Hob2s made easy work of them while I killed everything else. Every time I've run this I've used a ab fitted frigate to trigger the spawns rather then slowboat it there in my rattlesnake. The end result is I'm fighting the spawns from the warp in point rather then the trigger point where I guess most people are fighting from. I've noticed that the spawn inside the structure (grp2) and the spawn that appears when you destroy the structure (spwn4) are both about 100-120km away from me in their rest state, and they often retarget drones or fleet members, and reset back to their start points, I'm guessing there is a limit to how far from their spawn point they will fly. I found that i never got trigger spawns until i killed the last cruise batt , then killing them spawns trigger the next. Got 3k of drone goo about 65mil at dodixie min prices. Completed in passive Nighthawk with Dread Guristas Explosive Amp (x2) and a DG Heat Amp (x1), LSE II(x2). T1 Core Defence Field Purgers and CN Thunderbolt Heavy Missiles. I warped out once at the beginning to de-aggro Group 2. Completed in 1 hour 15min, most related skills at level 3 or 4. Total loot/salvage/reward was worth 43mil isk in Jita. Solo'able easilly in a TII passive Drake. once agro'd warpout, then back in at warpspot which is at distance from station. Take out frigates with drones. align away from ships cruise missile batteries to a warpout spot incase. then just start taking out the trailing BS's. With a good tanked Drake you should be able to tank until you are out of range of the Cruise launchers by that time you also should have taken out enough Bs's to stop and pop the rest before aproaching the cruise misiles batterise to take them out.